The story of the Galway institution. NEXT YEAR, TIGH Neachtain will celebrate its 125th birthday. 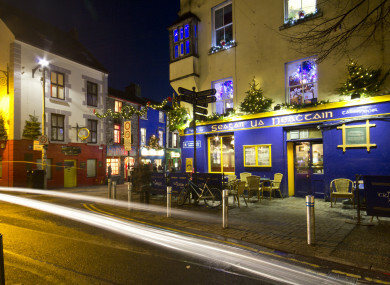 Situated in the heart of Galway City at the corner of Cross Street and Quay Street, it is now widely regarded as one of the city’s most vibrant and beloved pubs. Once a luxurious townhouse belonging to eminent animal rights campaigner and former MP Richard Martin, the pub has been in the same family since it first opened and continues to be run by Jimmy Maguire. It’s a listed building and is also home to offices and apartments. But it’s the pub that people gravitate towards. So much so that many of the pub’s staff even socialise there when they’re not working. “I often come in myself just to take in the atmosphere with a cup of coffee or a quick drink,” says Avril Hand, one of the pub’s managers. It’s just that kind of pub. Little in the pub has changed over the ensuing decades. The original snugs are still there and old drinks advertisements dot the walls. A picture of Maguire’s grandfather also has pride of place in the pub and staff lovingly refer to him as Grandfather Naughton. The pub is arguably chiefly known for being steeped in culture. Not only do local artists and musicians frequent it, but the pub is filled with paintings, sculpture and posters designed by local artists. Look up and you’ll see that the ceiling is covered in vintage posters advertising the Galway Arts Festival. Elsewhere, there are portraits of figures like Brendan Behan and quirky paintings by customers. “One of the regulars did a picture of the pub as if it existed in a different country,” says Hand. It’s a lot of stuff to catch the eye. In every corner, there’s something of interest. It’s also home to a host of local characters including Gerry Mulholland, a local pianist who often drops in to entertain customers with songs and poems. It’s not really scheduled, but he’ll come in. It could be a rainy day, the fires would be lit and he’ll sing something like Here Comes The Sun just to get a bit of atmosphere going. The pub also has an impressive food offering with chef Sarah Croffey serving up warming chowders, oysters and mussels, as well as cosy stews, soups and sourdough toasties. “It’s home comfort food,” says Hand. At this time of year, the pub really comes into its own as people return to Galway for the festive season. “A lot of people come home and the pub is a meeting point,” says Hand. “Someone will walk in the door and it’s like, ‘Oh you’re back from Australia!’ There’s always that kind of buzz in the place around Christmas. “It’s quite festive. A few little decorations here and there, the odd Christmas jumper. Email “'Someone will walk in and it's 'Oh, you're back from Australia! '': How Tigh Neachtains became a home from home”. Feedback on “'Someone will walk in and it's 'Oh, you're back from Australia! '': How Tigh Neachtains became a home from home”.